GNN: On your Kickstarter campaign page you give a pretty great rundown of what the series is about. I want to know: when did the idea come about? How did it start and perhaps evolve from initial thought to full-blown story? 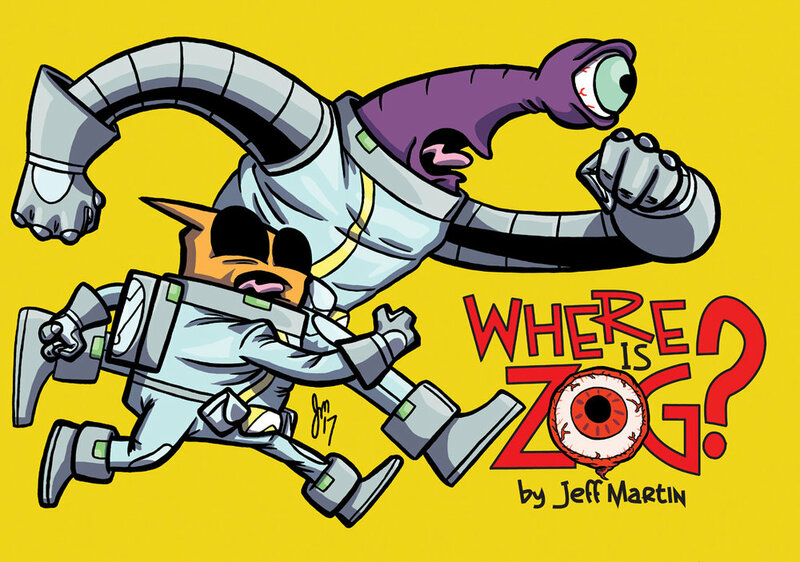 JM: The initial idea for Zog came in the spring of 2015, when I was driving home from the airport after returning from VanCAF. I had been asked to pitch a comic to a music magazine, and was trying to come up with something in the car. I was listening to GWAR's "Lust In Space" and the track "Where Is Zog?" came on. It starts with a driving chant of the title, and I started thinking about it as an actual question. Zog sounds like an alien word, and I started formulating ideas for an alien quest story. Most of the imagery is the result of turning ideas and feelings I get from GWAR songs into drawings inspired by '70s sci-fi aesthetics. 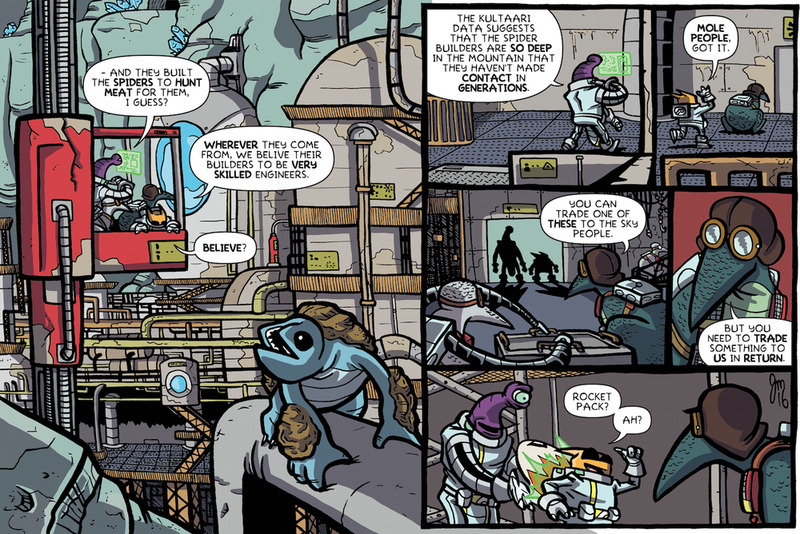 After that, Grum and Zill's personalities guided a lot of the story. GNN: Now, Heavy Metal is iconic, and Where Is Zog? ran on their website (HeavyMetal.com) from November 2015 through November 2016. So, from first contact to getting the green light, what did the pitch process involve? JM: Pitching to Heavy Metal was one of the easiest pitch processes I've ever had, which seemed absurd given that, like you said, it's an iconic publisher. The initial pitch was a cold email to the editorial address on the submissions page with a one paragraph high concept pitch and the first completed strip. I got a response a few hours later that it had been passed up the editorial ladder, and a week later it was accepted. There were a few emails after that to clarify what was allowed on the website versus the magazine, and then I got started. The hardest part was my editor going on medical leave and having to do some detective work to figure out who to send the pages to in his absence. GNN: With fun books such as Redcoats-ish and the Hockeypocalypse series already under your belt, you mentioned on your Where is Zog? campaign page that you'd: "...test the Kickstarter waters to make it happen." Were you hesitant about trying this type of crowd funding site? And what was it that made you finally decide that you were just going to go for it? JM: Very hesitant. It's a very public way of doing business that clashes with my desire to just keep my head down and draw new stuff. Doing a pre-order for my previous book, Wrestlemon, actually pushed me over the edge. I hadn't done one before, and only did it because the first printing didn't arrive in time for the Panel 1 Festival. The response was far more enthusiastic than I anticipated. That got me thinking that maybe a Kickstarter was the next step in building on that, and Zog was going to be a more expensive book, so it seemed like a good fit to be my first Kickstarter project. GNN: Now, with a little under 30 days left in your campaign, you're already 37% funded. You mentioned that you're blown away by that. Does this type of support get the adrenalin going - in that, it pushes you even more to ensure that you're communicating with your backers and potential backers daily? JM: My goal for day one was to hit 10% of the goal, and I hit that in the first hour, so I was definitely blown away by that. As of this writing, it's day 4 and it's just under 50% already. There's definitely a rush every time I see the backer list grow, and that really galvanizes me to push even harder with my promotional efforts. GNN: You've got quite a lot of great rewards for your backers with what seems like a pretty tight deadline of December 2017 delivery. Are you already starting to hammer out the sketches in preparation for fulfilling all the orders you'll have? JM: I haven't started the sketches yet, as most of them will be done in the books. I've worked with the printer before, and know their turnaround times, so a December deadline actually has a fair amount of slack in it. The book is being sent to the printer the day the campaign ends, so most packages will be in the mail before the end of November. GNN: I know it's early on in your Kickstarter campaign, but what advice would you give others who are contemplating going the Kickstarter route? JM: Researching campaigns by people of similar name value is really useful. If they do something that catches your attention, adopt that technique! It's also important to have an audience already, so that you have a base to build on. You'll probably have to front some money to do some books and/or cons to build up a reputation so that when it comes time to hit Kickstarter, you've got people interested in your work already. GNN: Has Heavy Metal asked you to pitch other work, or are you thinking of pitching them something new down the road? JM: I've pitched some stuff for the magazine, but who knows if any of it will see print, as there are only six issues a year. And, I can't wait until Jeff announces that his Where Is Zog? Kickstarter campaign has been successfully funded. Thanks again for taking the time to e-chat with me. This interview was written by Chris Doucher, Managing Editor for GeekNerdNet.